Who knew a 400-person Halloween birthday party for a 25-year-old could actually equate to the beginnings of a children’s school in rural Laos? But that’s exactly how Pencils of Promise was founded, and now, more than five years later, the organization has broken ground on more than 200 schools with no plans to stop. 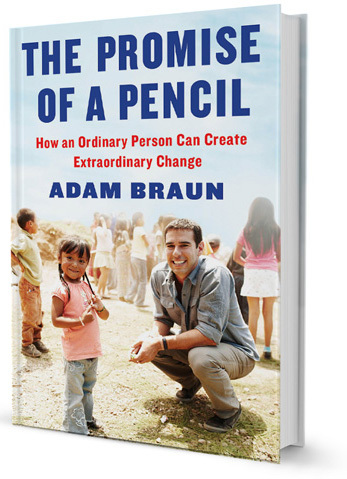 Today, founder Adam Braun’s book The Promise of a Pencil: How an Ordinary Person Can Create Extraordinary Change hits the shelves. The story details his path to life fulfillment and success with a guide for others to do the same. “Anybody regardless of age, status or location can create something of both meaning and merit. My story is a real-life example of that occurring,” Braun told us during an interview. “We met on the street, and it was just one of those powerful moments that changes the direction of your life,” Braun explained. A few years down the road, Braun opened a bank account for $25 and asked his friends to donate money for his Halloween-themed 25th birthday instead of giving a gift. It was then that Pencils of Promise was born. Braun is now helping tens of thousands of people across the globe. But instead of focusing inward at his success, he looks to others in hopes of fostering a similar attitude. “Make your life a story worth telling,” Braun tells us when asked one piece of advice he’d give to aspiring dreamers. Even though Braun is at a point in his life where he has become an inspiration to others, his work is far from over. Braun’s next big goal is to break ground on 500 schools. All proceeds from the book benefit Pencils of Promise. You can purchase your copy today from Barnes & Noble. For anyone going through a restless period in life, looking to make a change but not sure how, start with an ambitious but attainable goal. I set out to build just one school. Only after I realized that it was possible and how much of a difference it made in the life of others did I focus on enabling anyone else to have that same experience too. The key is to think big and then take small, incremental steps forward day by day. I used to send out lengthy email updates to my family and friends while backpacking, and people consistently said, “You should publish something.” I appreciated their responses, but I didn’t think the travel tales of a backpacker warranted a full book unless an impactful organization was born out of the things I learned on the road. But those comments got me thinking. As humans we are natural storytellers. We weave narrative into nearly every relationship we build and value. I realized that I needed to live a life that reflected the themes of the stories I wanted to one day tell, and when I veered off that path later on, it was time to make a change. Regardless of age or status, if you’re not satisfied with the path you’re on, it’s time to rewrite your future. Your life should be a story you are excited to tell.